Alabama QB Blake Sims runs for a 1st down against Mississippi State. On Saturday, the Mississippi State Bulldogs traveled to Tuscaloosa, Alabama to face the Alabama Crimson Tide. It was the fourth straight week of having matchups that could affect the final four rankings. Mississippi State has been the top ranked team for five straight weeks. Alabama was just outside the top four, ranked fifth. Neither team was able to score early in the game. After Alabama’s second possession, they were able to down a punt at the Bulldog 5 yard line. On Mississippi State’s second play from scrimmage, junior running back Josh Robinson was tackled in the end zone by Alabama linebacker Trey DePriest to give Alabama a 2-0 lead. After the free kick, Alabama drove downfield and connected on a 36 yard field goal to increase their lead to 5-0. Midway through the 2nd quarter, senior quarterback Blake Sims hit junior wide receiver Amari Cooper for a 4 yard TD to give Alabama a 12-0 lead. On the Crimson Tide’s next possession, Sims connected again with Cooper for a 50 yard gain to the Bulldog 1 yard line and sophomore running back Derrick Henry punched it over from a yard out to make the score 19-0. The Crimson Tide defense was dominating the game, but the Bulldogs offense finally got a little bit of momentum. Behind the running and passing of junior QB Dak Prescott, Mississippi State drove 70 yards in 14 plays, but had to settle for a 23 yard field goal to cut the lead to 19-3 at the half. Mississippi State received the 2nd half kickoff, hoping to cut into the 16 point lead. Prescott again led his team into the red zone, but the Crimson Tide defense stiffened and once again the Bulldogs had to settle for a field goal to cut the lead to 19-6. Neither team scored the remainder of the 3rd period, but early in the 4th, Prescott hit sophomore receiver Fred Ross for a 4 yard TD and the Bulldogs were now only down by 6 points. At this point, Blake Sims took over the game for the Crimson Tide. Sims ran and passed his team downfield, taking 6:07 off the clock and they finally scored on a 7 yard run by junior running back T.J. Yeldon. They attempted a two point conversion, but it failed which left Alabama ahead 25-13. Both defenses held on the next possessions and the Bulldogs got the ball back with 3:13 left and down by two scores. Prescott was finally able to get his team into the end zone, but it took them 13 plays and 3:03 off the clock to accomplish the score. With: 15 seconds left, Mississippi State attempted an onside kick, but Alabama receiver DeAndrew White recovered the ball and Alabama got the win by a score of 25-20. The win by Alabama propelled them to the top spot in this week’s ranking. The Crimson Tide has an easy game against Western Carolina and then the Iron Bowl against Auburn and possibly the SEC Championship Game on their schedule. If they run the table, they should have no problem locking down one of the four playoff spots. Surprisingly Mississippi State held on to a playoff spot by getting the #4 ranking. They have remaining games against Vanderbilt and eighth ranked Ole Miss remaining. They will need to win out and have Alabama falter to get into the SEC Championship Game. It remains to be seen if they can get a playoff spot without winning the SEC Championship. My guess is they won’t, but the Selection Committee has proved to be unpredictable, so they still have a shot at making it into the playoffs. 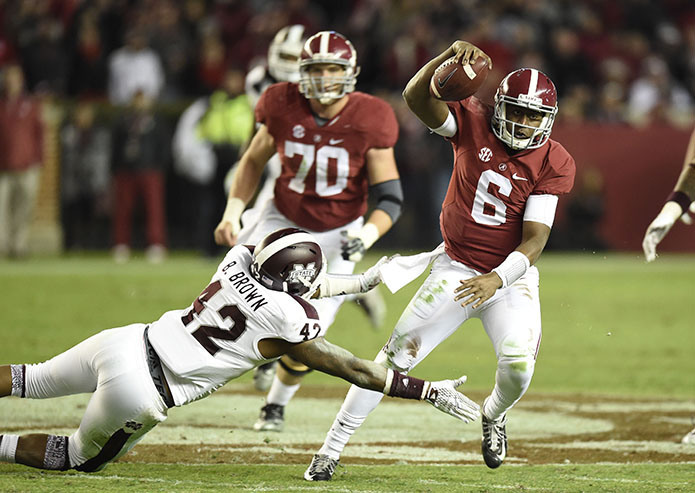 Blake Sims, QB, Sr (6-0, 209): No one in the country believed he would be the starting QB for the Crimson Tide, but he beat out a heavily favored Jacob Coker to become the starter. Doesn’t have great size for a quarterback, but is a former running back and is very athletic. Still growing into the position and has played better at home than on the road. Does a really good job throwing on rollouts and bootlegs. Does a good job off of play action fakes. Poised and has ice water in his veins when under pressure. Very elusive. Put his team on his shoulders in the 4th quarter and drove them for the game winning TD. Completed 19 of 31 for 211 yards and 1 TD. Had only 18 yards rushing, but they were all timely runs for 1st downs when his team really needed them. T.J. Yeldon, RB, Jr (6-2, 221): Tough player that was playing on a bad ankle. Has an upright running style that is reminiscent of Eric Dickerson. Great combination of size and speed. Very patient runner that picks his holes well. Great balance. Great feet. Good outlet receiver and is able to run pass patterns downfield. Great vision. Makes some amazing cuts and makes some good moves to get positive yardage in traffic. Led the team with 72 rushing yards and ran for a TD. Had 2 catches for 16 yards. Jalston Fowler, FB, Jr (6-1, 248): Versatile blue collar player. Does the dirty work that makes the offense go. Can line up at fullback, tight end or even as a running back when needed. A good lead blocker. Had a 35 yard catch. DeAndrew White, WR, Sr (6-0, 190): Versatile receiver that moves the chains. Very effective from the slot. Had 4 catches for 40 yards and recovered the onside kick to seal the win. Amari Cooper, WR, Jr (6-1, 210): Explosive player that hits top speed very quickly. Has become the catalyst for the Crimson Tide offense this year. Has good size and has the leaping ability to go up and get the ball over a defender. Possibly the best receiver in the 2015 draft if he decides to declare. Led the team with 8 catches for 88 yards and 1 touchdown. Had a spectacular leaping 50 yard catch that set up a touchdown. Had 1 drop. Denzel Devall, OLB, Jr (6-2, 254): Good special teamer. Downed a punt on the 5 yard line that set up a safety early in the game. Also had a QB hurry. Xzavier Dickson, ILB, Sr (6-3, 268): Very big for a linebacker. Does a good job stuffing the run and can stop a ball carrier in his tracks. Knows how to put pressure on the QB. Had 2 tackles and 2 QB hurries. Trey DePriest, LB, Sr (6-1, 227): Able to play inside or outside. Makes the on field defensive calls and gets everyone lined up in the correct spot. Has good instincts and is a very good run defender. Had 2 tackles, 2 QB hurries and scored on a safety. Called for a face mask penalty. Cyrus Jones, CB, Jr (5-10, 194): Gets picked on a lot, but does a good job standing up to the challenge. Plays good tight man coverage. Battles larger defenders and usually wins. Has ability to return punts and kickoffs. Had 4 tackles, 2 pass breakups and 1 interception. Landon Collins, S, Jr (6-0, 222): Versatile player with good size. Does a good job in the box or as a deep safety defending against the pass. Great tackler that flies to the ball. Good special teamer and has the ability to return kickoffs. Had 7 tackles and made a diving interception. Nick Perry, S, Sr (6-1, 211): Another in the line of good safeties at Alabama. Does a good job playing the run or defending the pass. Breaks well on the ball when it’s in the air. Covers a lot of ground. Does a good job defending the option. Good form tackler. Led the team with 12 tackles, ½ tackle for loss and had an interception. Dak Prescott, QB, Jr (6-2, 235): Was a Heisman candidate coming into the game. Powerful runner. Big arm. Good pocket presence. Tough to bring down. Struggled against the Alabama defense. Completed 27 of 48 for 290 yards with 2 TD and 3 INT. Led the team with 82 rushing yards. Josh Robinson, RB, Jr (5-9, 215): Short, tough runner with a low center of gravity. Hides behind blockers making him difficult to find. Able to start inside, then bounce it outside. Good power and has the ability to slip tackles. Had 12 carries for 37 yards and 6 catches for 69 yards. Robert Johnson, WR, Sr (6-1, 211): Good hands. Snatches the ball and doesn’t let it get into his body. Has the ability to return kickoffs. Only had 1 catch for 9 yards, but it was good for a 1st down on 4th and 7. Jameon Lewis, WR, Sr (5-9, 183): Was injured the last 5 games and missed 3 games. Has the speed and quickness to blow a game open. Bulldogs look to find ways to get the ball in his hands. Good vertical jump which allows him to play bigger than he is. Has the ability to return punts. Had 5 catches for 42 yards and 1 TD and 3 carries for 18 yards. Malcolm Johnson, TE, Sr (6-2, 231): Rocked up former wide receiver. Good concentration and is able to come up with the ball in a crowd. Had 4 catches for 74 and had a 30 yard catch. Jamerson Love, CB, Sr (5-10, 175): Physical corner that does a good job in run support. Able to fight off blockers and make the tackle. Had 4 tackles and 1 pass breakup. This entry was posted on November 19, 2014 by draftmaniacs in Scouting reports and tagged 2015 NFL draft, Alabama Crimson Tide, Alabama football, Amari Cooper, Benardrick McKinney, Blake Sims, Cyrus Jones, Dak Prescott, DeAndrew White, Denzel Devall, Derrick Henry, Eric Dickerson, Fred Ross, Jalston Fowler, Jameon Lewis, Jamerson Love, Josh Robinson, Landon Collins, Malcolm Johnson, Mississippi State football, NFL, NFL Draft, Nick Perry, Robert Johnson, Selection Committee, T.J. Yeldon, Trey DePriest, Xzavier Dickson.